This sponsored post is written in collaboration with Explore Local Box, a new gifting and subscription box service that provides customers an opportunity to explore a different U.S. city each month through local products and food. Most of us would agree: we want our travel destinations to be good communities to visit and live. If we love a place, we want it to be around for a long time. And we want what’s best for the people that live there. I know the term “responsible travel” can come across a bit heavy sometimes (and might conjure up images of visiting the principal’s office in sixth grade), but it’s really just about traveling in a way that helps a destination and doesn’t harm its culture, environment, or economy. A big part of responsible travel is supporting the local community, helping it to grow and flourish. It’s making small choices that make a big impact on local economies. Choosing to buy local is a great way to get started on your journey towards sustainability–whether you’re traveling or going about your everyday life. What does Buy Local mean? Locally-owned: The business is owned by someone from the community or local area who still lives there. Small business: In the United States, a small business is one that has fewer than 500 employees. The official classification numbers may vary around the world, but generally speaking, a small business is a non-chain, “mom and pop shop.” Some small businesses might have several locations or be a regional “chain,” but they’re not the big box stores. Locally-sourced products: The business you’re buying from gets its products or materials from other businesses (like farms, coffee roasters, breweries, or bakeries) within a certain mile radius. There’s no standard for the distance that “locally-sourced products” travel, so this could mean a variety of things. A coffee shop in a small town may get ingredients for its sandwiches (like the eggs, produce, and baked goods) from farms and bakeries within 5 or 10 miles, and the coffee may be roasted in the same town. A coffee shop in a large city may source products from farms up to 50 or 100 miles away since “farm country” is farther away. It’s awesome when you can find a locally-owned small business that also sources products locally. But let’s be honest, you won’t always get all that in one package. You might find a business that’s owned by outside investors but has restored an old factory (instead of tearing it down) into a cafe, and it uses locally-sourced ingredients. Or there could be a business that’s owned by a local family but gets its products shipped in from another state. So I want to acknowledge some gray areas here, but I also encourage you to look for those businesses that have a community-driven philosophy. And don’t be afraid to chat with the owners about these things. The best way to find out how (or if) they’re supporting the local community is to ask! 1. You get a more authentic experience. Whether you’re shopping, taking a tour, or eating at a restaurant, you get a more authentic experience when you buy local. Going where the locals go gives you a feel for the character of a city. 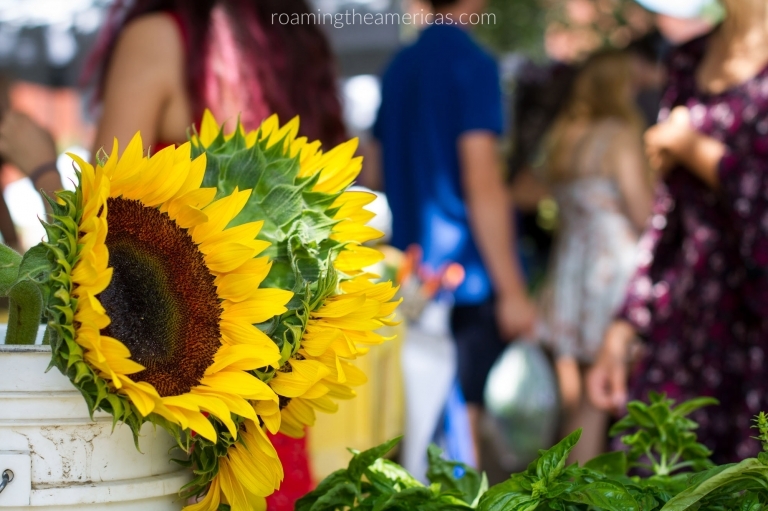 Last year when I was traveling in Burlington, Vermont I had fun people-watching and trying local products as I meandered around the farmers market on a warm summer morning with no particular plans. Taking a tour with a local guide is another great way to get a glimpse into local life. If you’re anything like me, though, the word tour might make you think of those double-decker buses carting around 150 people in all their touristy glory–cameras, sunscreened noses, and maps that just won’t refold. But I’ve had good experiences with small tours led by locals who tell local stories. The stories the tour guides tell help you understand the history and context of a place in a way you’d never be able to on your own. If you’re like me and love learning about new places, you can explore cities around the United States (even when you’re not traveling!) with Explore Local Box. Every month, you’ll get unique products made by local artisans from a different city in the U.S. The box of goodies gets delivered right to your door along with a fact sheet about the city. It’s like a mini tour that gives you insight to the city, supports small business owners, and will probably add a few places to your bucket list! 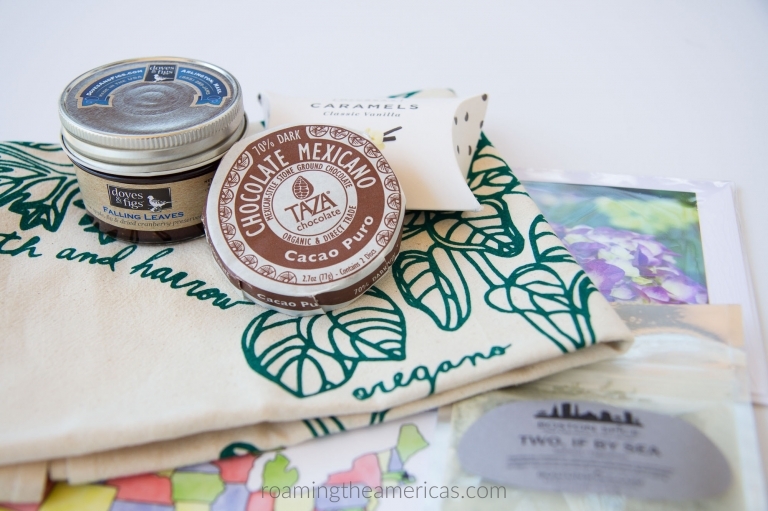 Explore Local Box with products from small businesses around Boston, Massachusetts: hand printed tea towel, note card, organic and direct trade dark chocolate, caramels, fruit preserves, and seafood spice blend. 2. You’re often treated more like family than a customer. Sure, this isn’t a guarantee. But when business owners are members of the community themselves, their business is more than just a place to get great products. It becomes part of the landscape of the community, and their regular customers are also their neighbors. 3. It helps you understand more about the local culture. You’ll learn what makes this place distinct. When you talk to locals that aren’t representing a corporate brand, you really get the chance to find out what daily life looks like in their hometown. You can go deeper than the surface when you shop at small, locally-owned businesses. Whether you’re in a small town or a cool city neighborhood, visiting the “mom and pop” shops gives you a feel for the culture and vibe of the area. You might overhear town gossip or get to know locals. While I was Burlington, I sat at a breakfast bar one morning and had a great conversation with a woman who was eager to chat with anyone who would listen. I jumped right in and started asking her questions, like what she loved most about living there. I had several similar experiences while traveling there, and those conversations gave me a feel for the city’s personality. 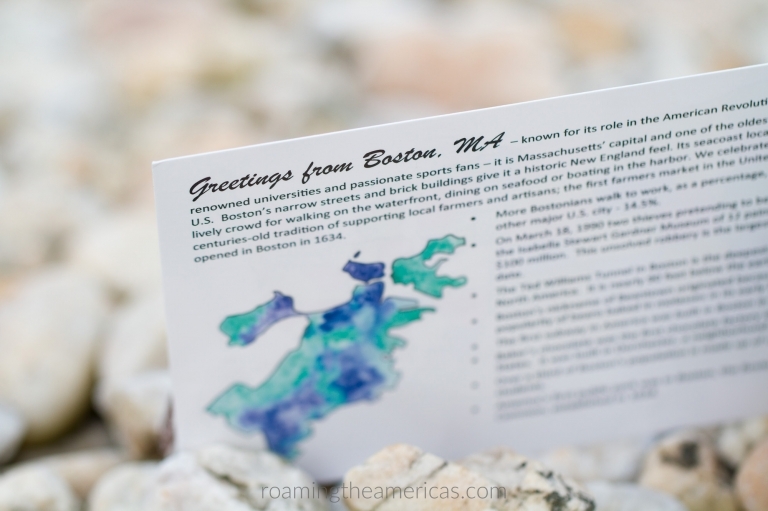 Fun fact: The first farmers market in the United States opened in Boston in 1634! 4. It supports the local economy. Not only does it give people viable job opportunities when you buy local, but it also encourages entrepreneurship and innovation. Small businesses employ about half of people who work in the private sector in the United States, and they strengthen the middle class (according to the SBA and these studies). I’ve heard about some unique products lately that are made in my home state of Maine–from coffee cups made of crushed lobster shells to tote bags created from recycled sails. 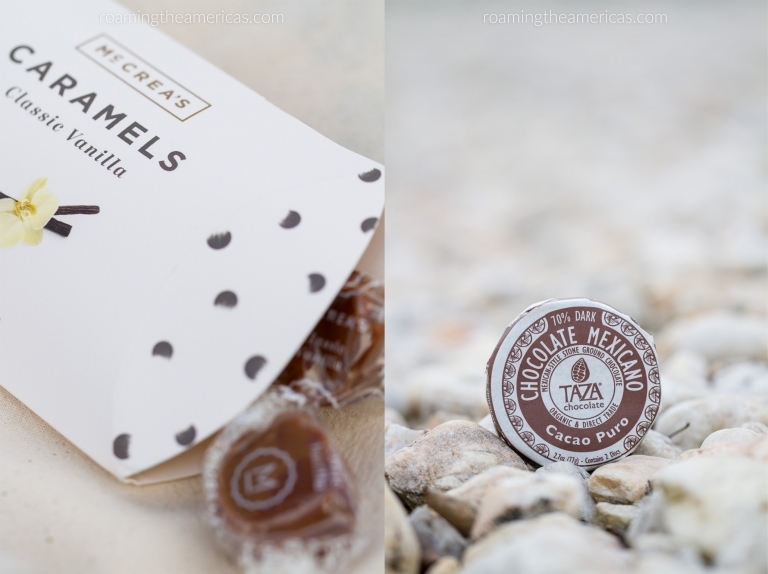 And there are high-quality artisan products coming out of every corner of the United States. 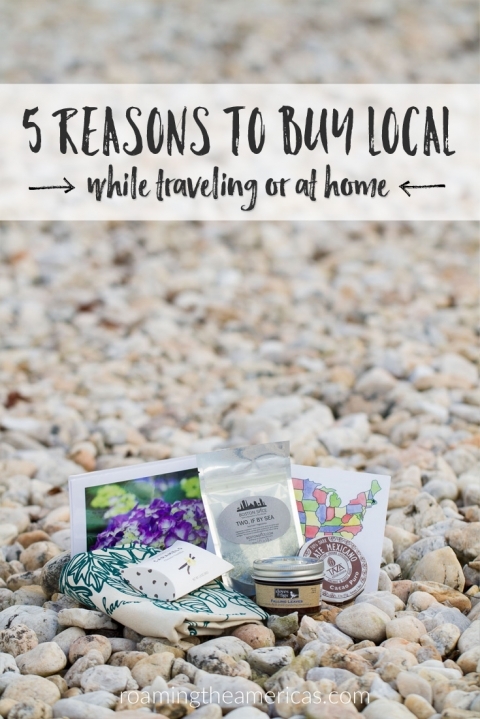 While stumbling across these products is half the fun of traveling in a new place, I love that Explore Local Box makes it possible to get a taste of what’s unique in cities around the country while you’re home. 5. It empowers local decision-making. This article shares another reason why supporting local small businesses is important: “Local ownership ensures that important decisions are made locally by people who live in the community and who will feel the impacts of those decisions.” If people live in the same community where they own a business, they’ll be more invested in the needs of their community. Their decisions won’t just be about what’s best for their business but hopefully will take into account local needs. You probably already support local businesses when you’re not traveling, so this is a great way to dip your toes into the world of responsible travel on your next trip. And if you’ve got the travel bug without any trips planned in the near future, check out the Explore Local Box to “visit” a new city every month! You’ll get unique (sometimes handmade) products from local businesses and get to learn some interesting facts about the city. You might even decide to plan a trip! If you order the Explore Local subscription by April 14th, 2017, you’ll get the Boston box (like the one I received). The May 2017 box will bring you goodies from Nashville, Tennessee. You can also order boxes from previous months as a gift–just head to their website to shop! Many thanks to Explore Local Box for sending me a sample and sponsoring this post so that I could share information about them with you. As soon as I heard what Explore Local was all about, I knew it would be a great fit for the responsible travel style that we’re all about in the Roaming the Americas community. Although the product was a gift and I have been compensated for this post, all opinions expressed are mine, and I’m committed to bringing you genuine content with real facts, photos, and thoughts.